Last month, Darlene ordered two dozen cannelés from Williams-Sonoma. We’d never had them before, as they seemed to be a luxurious, decadent treat only available online or in European pastry shoppes. FedEx delivered the styrofoam-and-dry-ice package. I took a look at them and couldn’t figure out what they were (besides possibly the mutant offspring of a baby Bundt cake). 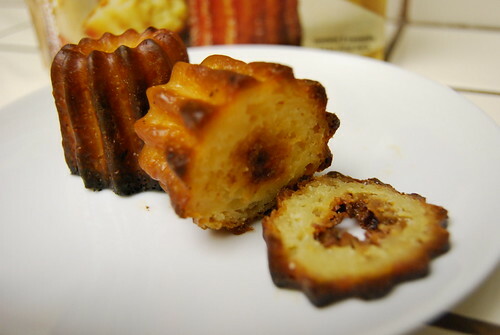 Darlene told me that cannelés are French in origin, are made with crepe batter and baked in muffin-type molds. The have a layer of beeswax (!) on top and a scorched, creme brulée-ish bottom. The inside is sweet and spongy. They stay in the freezer until ready for consumption, when they’re thawed at room temperature for about an hour. 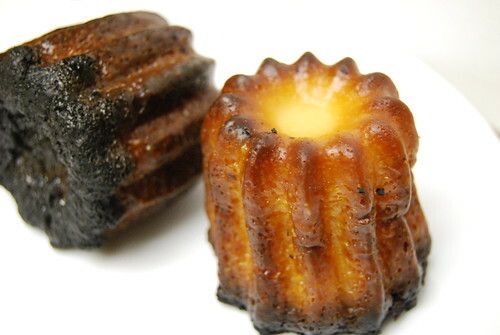 Darlene and I are in complete agreement regarding the Williams-Sonoma cannelés: They taste great, but (and it’s a big but) the scorched bottom is inedible. Yeah, I get it. They’re supposed to be scorched… but the damage goes a half-inch deep. And since these 24 cannelés ran $49 plus next-day shipping, that’s an expensive chunk of dough to be sliced off and discarded. Hacked off? Yes. Both literally and figuratively. About a week after the Williams-Sonoma cannelés arrived, we spotted cannelés locally… in the freezer section of Trader Joe’s! Of course, we bought a box. We thawed a couple and tried them, expecting to be disappointed in their quality vs. Williams-Sonoma. We were surprised to find the Trader Joe’s cannelés were not only just as good as the Williams-Sonoma ones, but the bottoms were only lightly singed. Trader Joe’s price? $4.99/half-dozen. Yeah — that’s about a third of the price. How could we have ever doubted you, Trader Joe? Now the trick is to make them from scratch. Until we crack the code, we’ll be giving Trader Joe’s our cannelés business. I suggest we go to France to try them fresh. Just sayin'. Try the ones from Le Pain Quotidien in L.A.
gail gand's book, "just a bite" has an interesting looking recipe for these. 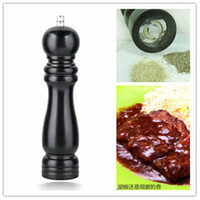 they scare me a little though, and you may need a special pan for them to get that scorched thang goin' on. I always wanted to hear someone's opinion on how the mail order William-Sonoma products were. 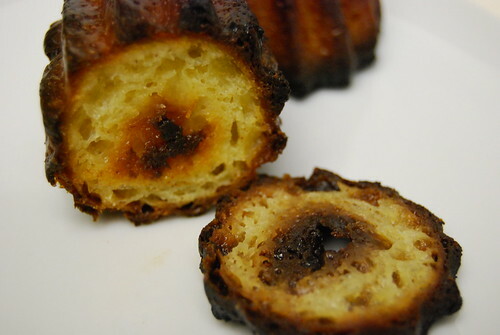 oh, yeah, take a plane to France to savor fresh cannelés. first discovered cannelles in boston @ clear flour bakery. 75 cents each! soo good!!! copper molds are on sale now @ W.S.com but they're still $14.99 EACH! France will spoil all sorts of pastry eating for you. Every one you try after that will just never stack up. Like pains au chocolat. Man, I want to go back.On the other hand, I had some really crummy French onion soup in France. darlene: But they all have b.o. You know this to be true.justjenn: On the ever-growing list of places to try in LA!ren: I wonder if we could get that scored thang with a butane blowtorch? I understand they're in short supply b/c of all the meth heads out there….emilyrena: When D ordered them, there were only a couple reviews on the William-Sonoma Web site. Now there are many and several are unfavorable. I hope they listen b/c that was an expensive disappointment.ronw: I'll wait until they complete the sub-Atlantic ÜberChunnel!hannahsbro: .75¢ each? Now we're talking! ROAD TRIP!cara mia: I hear ya; worst New England clam chowder I had was in Portland, Maine. Mmm… I made canneles using the recipe from Chocolate & Zucchini to some degree of success. I bought silicone molds, though, instead of the copper ones. I also really like the ones at Bay Bread bakery in SF. A visit there usually consists of canneles, macarons, and almond croissants.